I know what I want for Christmas: a national anti-corruption watchdog. Thanks to growing interest among parliamentarians, we might get one soon. We have been working long and hard for an independent, federal-level agency that can address undue influence in political decision-making and strengthen integrity across our government. Our board member AJ Brown has been busy these past few weeks working with key politicians, contributing his decades of expertise towards this ever-growing movement for action on corruption. Meanwhile, TIA and our board have been busily involved in progressing legislation to support whistle-blowers and crack down on money-laundering. 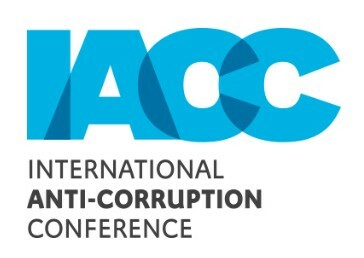 Continue reading our latest e-newsletter to see what we’ve said and done – including participating in the world’s biggest anti-corruption conference and Australia’s biggest mining conference. P.s. Don’t forget to grab a ticket to our upcoming conference. The levels of distrust in political institutions is staggering, TIA Chair Fiona McLeod told the ABC last month. 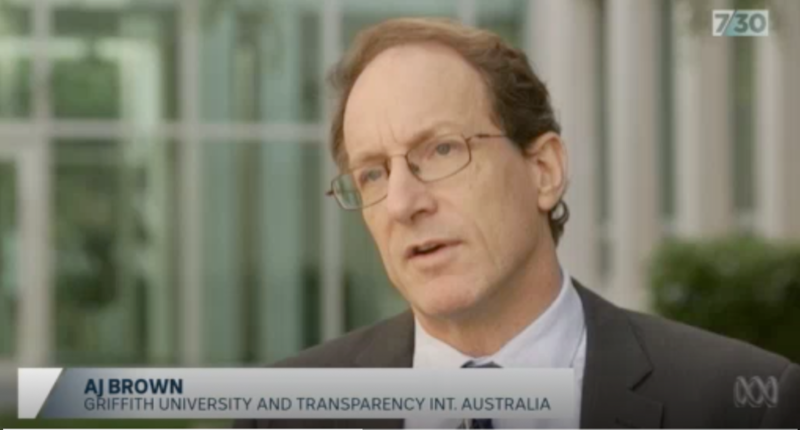 Last week, TIA Board member Professor AJ Brown told the ABC the momentum is now ‘unstoppable‘. The question is not will we have an agency, now ‘the only question is over the quality of model’. TIA is a proud supporter of important new research, led by TIA Board Member Professor AJ Brown, that found far too many whistle-blowers are treated badly. Whistleblowing: New rules, new policies, new vision comes as the federal government prepares to reactivate whistleblowing amendments to the Corporations Act. The research finds that while in theory, public and private organisations support whistleblowing; in practice, they are not as receptive to people who come forward with a concern. This new evidence demonstrates people need better legal protection when they come forward and blow the whistle on corruption or integrity issues. Recent reports indicate the Australian Government will not introduce much-awaited laws to tackle money-laundering, but instead introduce technical tweaks to current legislation. As the Government reviews the Anti-Money Laundering and Counter-Terrorism Financing Act, TIA urges Parliamentarians to take a strong stance against laundered money and illicit flows. TIA joined forces with the Natural Resource Governance Institute and the Extractive Industry Transparency Initiative to run a workshop at the world’s biggest anti-corruption conference. Screening Beneficials Owners to Combat Corruption in Oil, Gas and Mining, focused on how and why governments should understand – and make public – who ultimately benefits from their decision to grant a mining license or permit. TIA presented on two panels, spoke at a BHP lunch and hosted a breakfast side-event during the International Mining and Resources Conference in Melbourne. Sustainability was a big focus throughout the conference and we were glad to engage with mining companies and other groups as much as possible to address corruption. By combatting corruption in the mining industry and closing the loopholes that allow corruption to spread, we can better ensure people benefit fairly from their nations’ natural resource wealth, and minimise the industry’s impact on our natural environment. 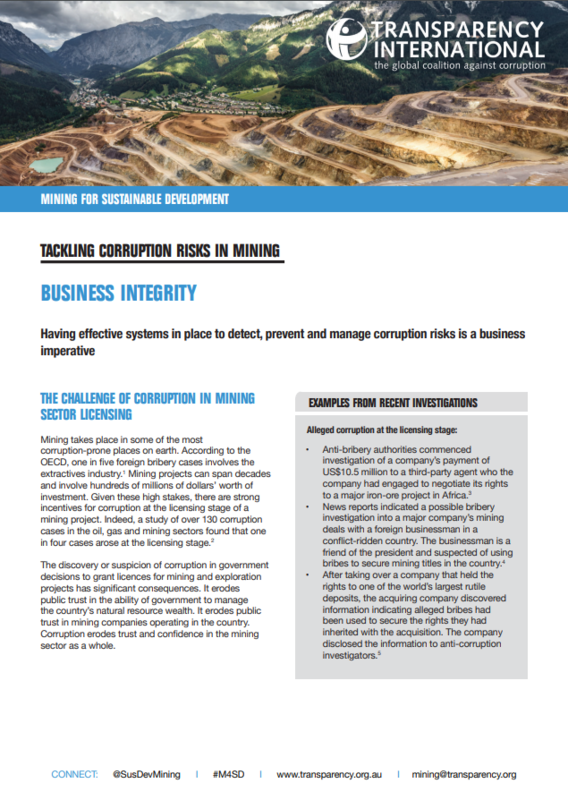 Business Integrity provides clear recommendations for businesses to mitigate the risks of corruption when securing exploration and mining rights and approvals. 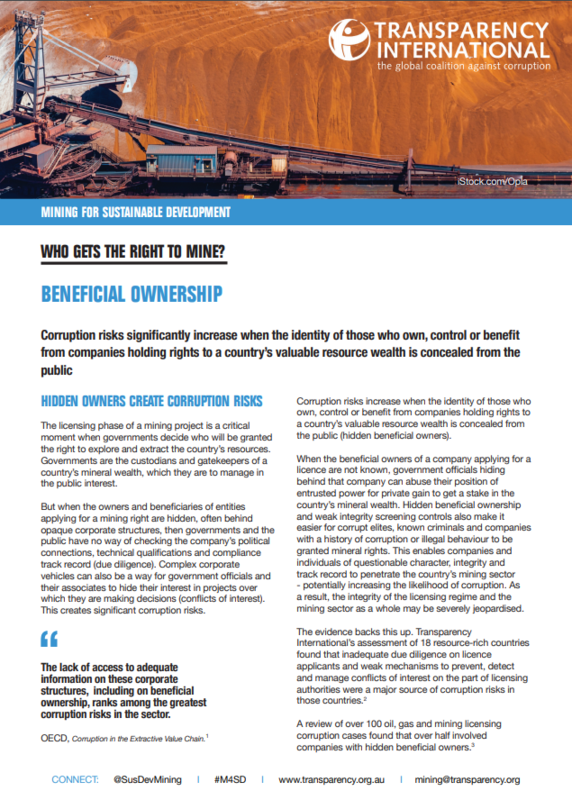 Beneficial Ownership outlines six steps governments can take to combat corruption when deciding who and under what conditions to award mining sector licences, permits and contracts. TIA was well represented at the TI Annual Members Meeting in Copenhagen. It was a great opportunity to introduce our new chair Fiona McLeod, and less new Head of Program, Nicole Bieske to TI colleagues. One of the highlights was a powerful presentation from TI Maldives on the need for our anti-corruption work to be more aligned with human rights protection and the safeguarding of democracy. We heard of new challenges for TI. We are facing a devils triangle of oligarchy, authoritarian regimes and xenophobia – all of which cannot function without corruption. How can business, regulators and the community work together to restore and strengthen integrity in public and private institutions? Tackling Corruption Together, TIA’s second biennial conference, is a special opportunity to learn, share and discuss how industry leaders from finance, mining, and real estate are addressing corruption. Visit the conference website to purchase tickets and find out about speaking and sponsorship opportunities. You are welcome to join our Annual General Meeting in Melbourne at 5pm on Tuesday 27 November. Hear our CEO Serena Lillywhite’s report on TIA’s activities in the past financial year and our Chair Fiona McLeod’s outline of our priorities for the years to come. Baker Mckenzie is kindly hosting us in their offices at Level 19, 181 William Street.